Do you work in a school setting? Would you like to learn more about Funky Feet? Learn how we can deliver a high quality PE session for your nursery and reception children. 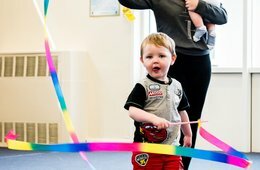 Discover how you and your child can benefit from one of our community based Funky Feet sessions. We deliver a full programme of sessions over the week in different locations. Do you work for a private setting ? 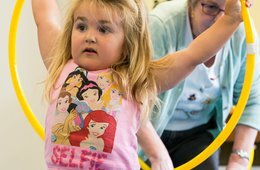 Are you interested in finding out more about our Funky Feet programme? Find out the benefits of having Funky Feet in your organisation? 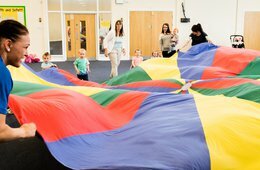 Funky Feet is a half term long, physical activity programme for young children. It is designed to develop your child’s fundamental movement skills through fun physical activities. 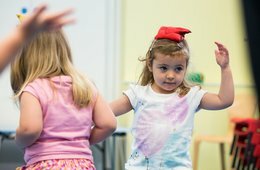 We make these sessions fun by basing them around dancing, music, games and all while interacting with other children. Each session will stimulate the physical and cognitive development of your child, creating the foundations a child needs to develop the basic skills they need to participate in sporting and physical activities as they grow and develop. 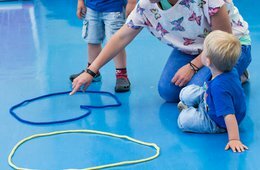 The Funky Feet programme adheres to EYFS – a national set of standards of learning, development and care for children aged from birth up until 5 years old. Funky Feet is suitable for children age 2-6 years old. Our sessions are designed to engage parents or guardians and their child in fun physical activity. This parent interaction eases the child into their surroundings encourages them to take part and means they have more fun and learn more! At Funky Feet parent/ guardian participation is mandatory so no sitting on the bench watching - adults are active participants too! We tailor the Funky Feet programmes to the following areas; Parents, Teacher & Organisations. Packages can be customised to meet your needs. We understand all organisations are different and pride ourselves on our flexible working practices. WHAT MAKES FUNKY FEET DIFFERENT? When we developed Funky Feet, we paid particular attention to the “attitude” of coaches, taking into consideration how they think, manage their emotions and behave. All our coaches are considered to possess emotional intelligence, a quality we believe is essential for the effective development and management of positive relationships with children and parents. This attitudinal model of delivery is what sets us apart from similar programmes or groups, which place much greater focus on a technical model of delivery. Children learn through their senses including observing and mimicking those close to them. When pre-school aged children play, they learn and as such we focus much of our attention on providing a fun setting where children can play, have fun and learn. Playing allows children to gain a sense of their own abilities, improves their confidence and lets them feel good about themselves. You know yourself – when something is fun, you engage more with it and get more out of the activity. 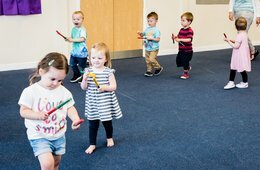 Fundamental movement skills such as running, jumping, hopping, skipping along with co-ordination and balance are learned and developed through a variety of different action songs. Songs are a mix of childhood favourite nursery rhymes along with catchy songs that are quickly learnt. Each session also incorporates an element of structured behavioural play, revolving around a different piece of equipment each week. For example our sessions include, bean bags, hoops, racket and ball etc and are planned in a way so that each sessions focuses on teaching your child something new, or helping them to develop in a specific way. 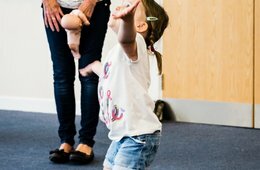 It has been proven that group play helps young children to develop their physical, social, emotional and intellectual skills through participation and interaction – a key reason why Funky Feet was created. Jennie delivers a range of Funky Feet community sessions. Joanne delivers and works alongside the teachers on Funky Feet School Sessions. Lisa delivers a range of Funky Feet community sessions. WHAT OTHER PEOPLE HAVE TO SAY..
60% of their children have tried & started to eat fruit – something they didn't do until seeing other children eating fruit at Funky Feet sessions. ‘We can tell the difference between the children who have attended FF and those who haven’t. Confidence, the ability to listen to instruction and a willingness to participate in group activities are some of the characteristics that those attending FF come armed with. ‘We found the funky feet session’s lots of fun with our nursery children. They enjoyed the repetition of the warm up songs and looked forward to the session each week. Often children would be saying "Is it FF today?" The children enjoyed using the equipment in different ways. The staff found it helpful to have new ideas and suggestions about using equipment that we already have in school. ‘As a Reception team we felt that FF was a lovely programme that kept the children excited and motivated through their physical education. The songs were catchy and the moves repetitive in a way that children learnt them quickly. It linked well with the Foundation Stage Curriculum and used a wide variety of resources which we don’t necessarily have in school.